The Indian Citizen's Burden: Will you apologise, Mr Modi? Is her village her problem, Mr Modi? Amidst the uproar in Parliament over the abusive language used by a BJP minister, what has slipped unnoticed is a statement of grave significance by the Prime Minister of the country. Faced wtih protests over the behaviour of his intemperate colleague Niranjan Jyoti, Narendra Modi sought to excuse her on the grounds that she is 'from a village'. In one stroke, he has exposed his own gross ignorance, as well as done a great injustice to 70 per cent of Indians living in villages. 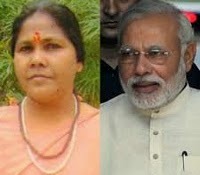 The Indian villager already suffers from the stereotype of being ignorant, or a fool - Modi's statement now multiplies that untruth and suggests that she is also foul-mouthed and abusive. Actually, the truth is quite the opposite. Having watched village life closely for the last five years, I can say with certainty that it is the villagers who move out to towns who, on return home, come with a variety of bad habits, including the use of vulgar language. A second source of depravation is tourists, again from the cities, who apart from the material filth that they throw out of their cars, also 'educate' villagers through their own behaviour of drinking and gambling and the use of foul language. A third source is television, and movies, again produced by those in the metros, which introduce the villager to previously unheard of and unimagined ways of (mis)behaviour. So, will you apologise now, Mr Modi? It may not be that every bad habit originates from the city, but if you observe closely, you may be surprised that most do. An example of this is Kempty, a small town 15km from Mussoorie, and the villages surrounding it, where my friends Pawan and Anuradha are running their education NGO. Once, the 12-year-old boys in the SIDH rural school where I was teaching were found to be using the f-word while playing, without of course knowing what it meant. When asked, they said that Shane Warne and other cricketers would always shout 'f---' while bowling. Such examples, received constantly from cities, are imbibed first by those among the village youth who are wasters, to be found loitering in the bazaar whiling away their time, who don't participate in any production work. These are the youth who are ripe for migration, who have inwardly rejected the village and are ashamed of it, who are under the spell of the 'developed' city folk, and have dreams of making quick money. On successful migration, some of them may join politics, one of them may even become the Prime Minister. He may even launch a scheme to 'adopt a village'. But the old prejudice remains, and so one day it slips out in the Lok Sabha. One must of course remember that this incident was reduced to an 'abusive language episode' but it was not quite that. It was a religiously divisive language used for a devious political purpose. Anyway, let us ponder upon a simple question. Think what would happen if Modi had used any other identify instead of 'village'. What if the Minister's bad language was associated with her being from Ayodhya, or her being a UP-ite, or that she was from the RSS, or simply on her being a Woman? The nation would explode with defenders lining up to protect these identities. Even smaller groups have their active spokespersons - businessmen, eunuchs, homosexuals, and even animals. If for instance, someone said her behaviour is as bad as a dog's, then a lot of dog lovers would be growling on television. But 70 per cent of India is castigated in one sweeping mis-statement, and there is not a whimper. And this is the tragedy of a modernising India. Our greatest single majority, which works the hardest and feeds the entire nation, and also keeps our cultural tradition alive, is derided and kicked around by all; we seem to have no gratitude. As an aside, let me sign off with this question: if indeed we are ashamed of rural India, which is 70 per cent of the population, and we are ashamed of our corrupt politics and bureaucracy and our police force, and our exploitative big businessmen, and lately, of our shameless cricket administrators, what then is the India that we are proud of, or want to continue?